Understanding where we come from is a key part of knowing where we are going. The social studies at F&T are about equipping historians and researchers with the tools they need to understand and evaluate evidence, identify perspective and bias from actors in a situation and take positions on matters of historical and contemporary importance. Historians can find parallels between events and phenomena in history and identify how to or how not to handle a situation based on how it has been addressed in the past. Historians can identify injustice in our past and describe ways to advocate for the end of oppression and inequity today using their knowledge of the structures of power and examples from the past. Students engage in historical research, writing and presentations from grade 6 through grade 12 with commencement level PBATs normally completed in grade 11. Grade 6 is the beginning of a three year survey of American history. We begin with the indigenous groups that first populate the Americas and continue through the development of the US Constitution. Units of study include Three Worlds Meet, the Thirteen Colonies, Revolution, and Designing a Government. Students spend a large chunk of time engaged in reading secondary and primary source texts, discussing and presenting their work with one another. In grade 7, students engage in topics that reflect a growing young nation. Units of study include Westward Expansion, Civil War, Reconstruction, Progressive Era and American Imperialism. Students examine a societal change that emerges from the Progressive Era in an expanded writing task that is also presented to peers. A great focus is placed on developing a clear writing style for an academic audience and on the integration of appropriate sources into discussion and student writing. Students in grade 8 complete their survey by looking at the 20th century and the dawn of the 21st. Units of study for this year include World War I, Roaring 20’s and Great Depression, World War II, the Rise of Communism, the Civil Rights Movement, and Modern Issues and Topics. Students complete their expanded writing by researching a modern topic to explore in more detail and present to teachers and peers. Grade 9 students meet their economics requirement in a survey of economic principles with a historical lens. Economic concepts are explored through a series of characters and units that illustrate the forces and choices that are part of different economic systems. Eras that are explored include European exploitation and colonization of the Americas, roots of the American economic system, and the economics of slavery and a close reading of Ta-Nehisi Coates’ The Case for Reparations. 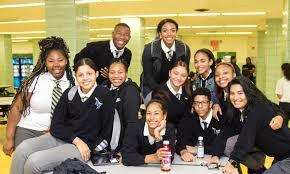 As sophomores, students have two major goals: to be College and Career Ready on the Common Core English Regents, which all students take for the first time in June of tenth grade, and to build the skills they will need to score a competent or higher on the commencement level PBAT rubric in eleventh grade. The course seeks to answer the overarching essential questions: How do power, gender, and love intersect? How is power gained, used, and justified? How does gender affect one’s societal experiences and personal identity? What are the roles of love and jealousy in our lives? Students read and then write about grade level appropriate whole class texts and book club books at their instructional level. The Common Core English Regents requires students to have strong reading comprehension skills, with a specific focus on identifying author’s purpose. As a result, the curriculum is designed to allow students to practice with both multiple choice and short response questions on grade level appropriate texts throughout the year. Students are also prepared by this course to be able to complete both the writing from sources task, an argument essay that asks students to make a claim based on a range of nonfiction texts and a text analysis response which requires students to identify literary elements that support a central idea in an unfamiliar text. Students in grade 12 engage in a two semester sequence that can fulfill 1 US Government requirement or 2 US History requirements. The fall course is a study of presidential history with three units of study: checks and balances in history, electing a president and presidential powers in times of conflict. Students examine at the end of the semester how much power a president has and where that power comes from. The spring term is a unique opportunity to study the intersection of history and culture in our own community. The course examines the economic, geographic and political roots of hip hop music, examining its local roots and lyrics to understand the conditions around its emergence and growth as well as its significance and social impact today.